New York’s largest police union is nothing if not consistent: The Police Benevolent Association of the City of New York (PBA) has aggressively opposed even the most minor reforms concerning police accountability and criminal justice for decades. In 1966, Mayor John Lindsay proposed establishing a Civilian Complaint Review Board in response to rising public concern over police brutality; PBA members protested in their thousands, lobbied and managed to keep civilians off the police-oversight agency for another 20 years. When Mayor David Dinkins put forward a police-oversight plan in 1992, the union organized a near-riot outside City Hall, jumping on cars and breaking barricades. 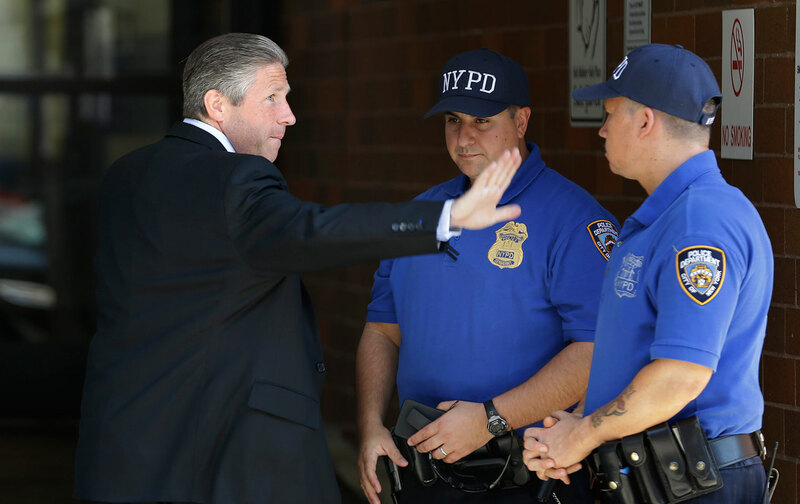 In 2014, the blustering union president Patrick Lynch said that “blood was on the hands” of Mayor Bill De Blasio following the murder of two NYPD cops. The mayor’s crime: deigning to mention the problem of police violence in the months before the attack. But nothing whips the powerful police union into a fury like the possibility that an individual convicted of killing an officer might one day walk free. “Keep Cop Killers in Jail for Life” is among the animating missions of the PBA—a whole page on its website, labeled “Cop Killers,” is dedicated to this issue alone. The New York State Board of Parole, which determines the release of eligible prisoners who have already served their determined sentences, currently consists of 12 commissioners appointed by Governor Andrew Cuomo. In recent decades, the board was typically made up of individuals with previous law-enforcement careers who naturally tended towards denying parole. Over the last year, though, with the adoption of new regulations and the addition of new commissioners without law-enforcement backgrounds, the board has granted some long-overdue releases. As I have previously written, the decision to grant parole after 44 years to 70-year-old Herman Bell, a former Black Panther convicted of the 1971 murder of two NYPD officers, was a litmus test for whether the parole board would follow its own guidelines and release the aging man with a stellar institutional record, or bend to the political influence of the police union. In 2018, the PBA reacted with ire to Bell’s release; Lynch, with his flare for blatant racism, stated that “to let this animal onto the streets is disgraceful.” The union continues to pursue strained legal avenues to see the septuagenarian back behind bars. Both Governor Cuomo and Mayor de Blasio publicly condemned the board’s rightful decision; the parole board’s decision later in the year to release Robert Hayes, also a former Black Panther, was a heartening signal that the commissioners would uphold the principles of parole rather than kowtow to police union pressure. The PBA has since doubled down on its campaign. The powerful union is taking aggressive aim at the New York State Board of Parole at the very moment parole reform is moving (albeit slowly) in the right direction. If the police union is successful in its efforts with regards to “cop killers”—as it historically has often been—it would undermine the very premises on which the parole system is supposed to function. The PBA’s go-to tactics include hammy appeals to public safety and citizen’s concerns. Last week, the police union announced that it would hand-deliver to the parole board tens of thousands of letters, apparently written by members of the public, asking that “cop killers” never be released. The police union claims that since 2014, some 200,000 letters from the public have been “purposefully ignored” by the board. The story behind these letters gives lie to the police union’s claim of vast public support and exposes the cynical efforts it is willing to undertake in its crusade against reasonable parole decisions. Two hundred thousand individuals did not write to the parole board; the PBA’s letters represent as few as around 3,000 people clicking on a website link. The vast majority of letters were automatically generated by the PBA’s site, which invites visitors to “send a letter for all cop killers” in a bold red font and then generates 62 separate letters with one click—one for each “cop killer” listed on the site. According to Corrections, between 2012 to 2014, the department enabled what RAPP’s Whitehorn called a “secret pipeline,” by which these mass-generated letters would be dispatched directly to the parole board through the police union’s online portal. Without warning the police union, Corrections shut down the portal between its site and the PBA’s in 2014, around the same time advocacy organizations like RAPP were mounting pressure on the board to grant release to aging prisoners. Now, the union and its supporters have to complain to the parole board like any other members of the public (DOCCS has a link on its website for such messages and accepts mail). The union only discovered the change in February—that’s the downside to automating letter-writing–and took it as evidence of a “decision” to “ignore” the public. More optimistically, the letters saga indicates fresh independence in the parole board. In 2017, administrators brought in new regulations in an attempt to instantiate what should have long been standard practice: basing parole decisions on an evaluation of the inmate’s risk to the public instead of the nature of the crime that led to their incarceration. Last year, Governor Andrew Cuomo appointed six new parole commissioners, a number of whom have a history in public health and family services, rather than the typical law-enforcement careers of parole commissioners. The new regulations stipulated that hearings would no longer serve as a relitigation of an original crime but, rather, a reasoned consideration of an individual and their circumstances at the time of their parole hearing. Such changes are especially crucial for aging prisoners who have served lengthy sentences and pose a negligible risk of recidivism. Even some members of law enforcement also now argue for shifts towards a more presumptive parole system when aging prisoners are concerned. “Imprisoning the elderly is extremely expensive—estimated to cost between two to five times as much as a regular prisoner, and potentially costing hundreds of thousands of dollars per year. On top of that, it’s ineffective,” said Maj. Neill Franklin, a retired police officer and executive director of the nonprofit Law Enforcement Action Partnership. “Most people simply age out of crime as they get older, and very few people over the age of 55 constitute a public-safety risk,” Franklin said. The PBA’s letters stunt is thus best read as a scrambling reaction to a parole board no longer entirely under its thumb. “There has been a major shift in parole decisions in the past three years,” Albert O’Leary, the PBA’s communications director, explained. “The nature of the crime used to be the leading consideration for release, but has been reduced to the least-considered factor under changes implemented internally by DOCCS without public review or comment.” It has, however, been in the parole board’s guidelines since 2011 that assessments about a prisoner’s current “risk and needs” be given major weight in parole considerations, rather than a focus on the nature of the original crime. New regulations simply asserted that this guideline should be upheld. The parole system is still mired in problems both procedural and structural. The New York State Parole Board is currently understaffed (there are seven vacancies), leading to harmful and cruel delays. That an incarcerated person will likely not be granted parole unless they admit guilt and show penance in front of the board leads to gross injustices for the many innocent individuals in prison who have exhausted their limited appeals. But for the parole board to both enact and assert its independence from the police union and the political power it exerts constitutes a notable and welcome shift. It’s high time that the PBA’s mendacious campaigns for police supremacy be met with the silence they deserve.